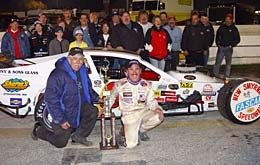 In a what would be considered somewhat of a surprise, it has been announced that Ted Christopher and the #79 Hillbilly Racing team will pair up for the first NASCAR Whelen Southern Modified Tour event next weekend at Caraway Speedway (NC). The team’s regular driver, Eddie Flemke, has a prior commitment for the weekend. The tow will be a short one for the #79 team. They are based about an hour away from Caraway in Westfield, North Carolina. When it comes to ironman racers, there aren’t very many guys out there that have much on Jerry Marquis. Early in his career, Marquis would be a regular at three or four tracks every week. Back in 1991 for example, he drove in the Modified and Pro Stock classes on Friday nights at Monadnock Speedway (NH) and Saturday nights at Riverside Park Speedway (MA) for three different car owners on his way to a NASCAR regional championship. Jerry Marquis will be back in Busch North for about half of the 2005 season. The two drivers will return to more familiar seats when the NASCAR Whelen Modified tour (Northern style) kicks off their season on April 10th with the Icebreaker at Thompson Speedway. Flemke will be in the #79, while TC will be back in his Mystique Motorsports #13. Christopher has enjoyed some pretty good success south of the Mason-Dixon Line in recent history. He won this year’s Speedweeks championship at New Smyrna Speedway (FL) and has a SMART Modified feature win at Concord Motorsport Park (NC) last year. Both of those accomplishments came with #00 Brady Bunch car. Over recent seasons, Marquis has focused his energy on the Whelen Modified Tour with a limited schedule in Busch North racing in his free time, but for 2005 his plans are getting ambitious again. Marquis’ priority will be driving the #4 Mystic Missile Modified, but it won’t be his only ride for the year. The new combination will debut on March 24th with the annual Spring Sizzler at Stafford. Competitors with a PASS Pro Stock in their shop now know what tires they will have to bolt on for the next three seasons. The series has signed into an agreement with Race Tires America and regional distributor Northern Tire for the next three seasons. Teams will continue to run the American Racer tires that they have been competing with over the past four seasons. The majority of Pro Stock tracks in New England also run the same tires, so Saturday night invaders into PASS will be running on familiar rubber. There is no doubt in talking to Marquis that despite his years of experience, he still has fun every time he buckles into a racecar. To follow up on a story from a few weeks ago, Seekonk Speedway (MA) has reversed a decision that they made to schedule the Seekonk Youth Racing Association events for 2005 during the early afternoon, rather than use the division to lead into a regular Saturday night racing card. Competitors protested the proposed change of starting races earlier in the day. (Please click here for more) and their objections were considered by management. Physical improvements are also underway at the quarter mile track. A new third turn tunnel and a scoreboard are planned to be in place for this season. Seekonk has been notorious in the past for a lack of a scoreboard or lap counter viewable to spectators. One of the most successful fendered drivers in Connecticut over the past 15 years has picked up a new ride for 2005. Jay Stuart will drive the #48 Late Model owned Marcia Kretschman. The ride was vacated by Mike Quintiliano during the off season. The #48 team has finished second in points in the division for two years running and posted six victories during the same time period. They have only finished out of the top ten five times in their last 38 starts. Meanwhile, Stuart has posted some impressive numbers at the track as well. Between 2001 and 2003, he logged 13 wins at the track.